When Pionic Pizza first opened up on 2643 N. Campbell Ave., for some reason a lot of my friends asked me if I was going to go. I guess it's the food writer thing, the 'new kid in the neighborhood' thing and, most importantly, the pizza thing. Of course I am always up to try something new, especially when it comes to pizza, but upon further investigation, Pionic really didn't seem like a place I would be into. The first thing that got me was the fact that, at first, I thought it was a chain. It just had that look and feel of a plastic mold of yet another plastic mold, probably starting in Phoenix, making its way to Los Angeles, then perhaps settling on some college stretch in New Mexico before finally making a settlement here in Tucson. It had a logo, it had a concept, it had a mission statement...all the trappings of a corporate bore that thinks if you put sauce on dough, add some cheese and a cured meat on top, toss it into the oven for a few minutes and what you have as a product is technically considered "pizza". The other factor in my hesitation, was the location it chose to wriggle its way into. The stretch of Campbell Ave in midtown Tucson, between Grant and Ft. Lowell, is more affectionately referred to as "Pizza Row", and I felt it did not need another mediocre pizza joint because the options were already too wide. 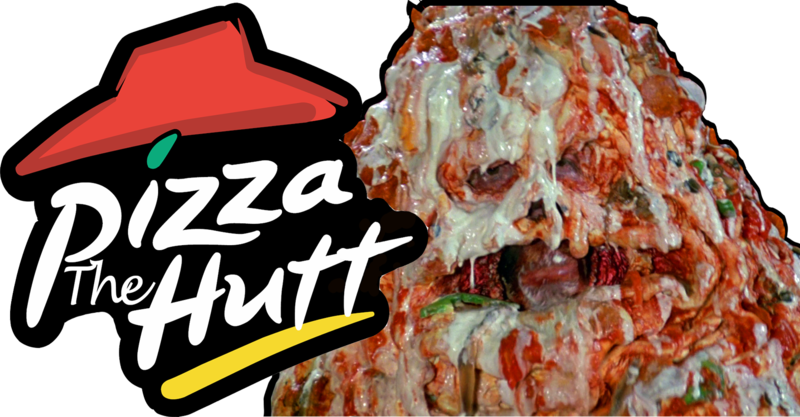 You have your great pizzas from Upper Crust and Old Chicago, the artisan from Sauce, the standard stand-bys for late night munchies from Hungry Howie's and Blackjack and there's even a Pizza Hut right in the middle to round things off. Another pizza stand just seemed like white noise. Here's the thing: Pionic Pizza knows that Subway and Chipotle are simple ideas turned into billion dollar businesses. You have a few options, a bunch of fresh ingredients, you let the customer pick out what they want, cook and prep time is minimal and, zing!, you are on your way with food that's not a Mc Creffin burger with plenty of time to pursue a life of religious fulfillment. Easy. And that's what Pionic is. You have a pizza option, a pasta option and a salad, you pick out what you want on it, it takes less than two minutes to prepare the cooked items, you pay the nice kid at the register, you take the food, you eat the food and you still have time to make your kid's dance recital and grandma's funeral. It's a good concept and if the minds and wallets behind Pionic make the right decisions, this too can be a successful vocation. But how is the food? That's the important thing here. If the grub is less than satisfactory then they're going to be treading on water until they can paddle their way out of mediocrity. If it's bad then you just have to write them off and call it a "nice try". But...but! 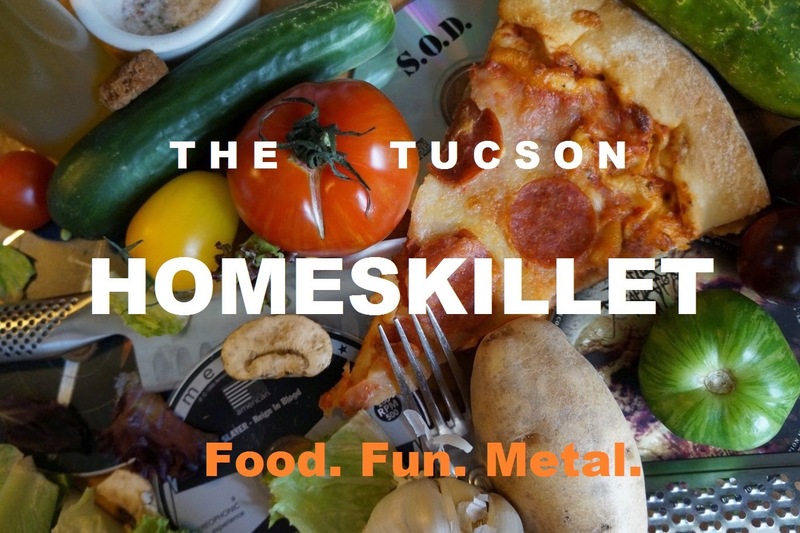 if the food is great then, yes, they can clearly be on their way and I'd be proud to say that, yes, I knew them way back when, back when they were just a small store front on Campbell Avenue in lil old midtown Tucson. So we ordered up a good variety of stuff: a veggie pizza, a basic peperoni pizza, a pesto pasta and a loaded salad. You know, one of each. It's...our job. The veggie pizza consisted of red sauce, light cheese, mushrooms, red onion, tomatoes, artichoke hearts and finished with arugula. You know what, it was actually alright. Cooked in a blisteringly hot oven for 90 seconds, the crust was crispy with a decent chew, the sauce was...fine; not too sweet with a good balance of flavors and the toppings were surprisingly fresh. So far so good. We were pleasantly pleased. 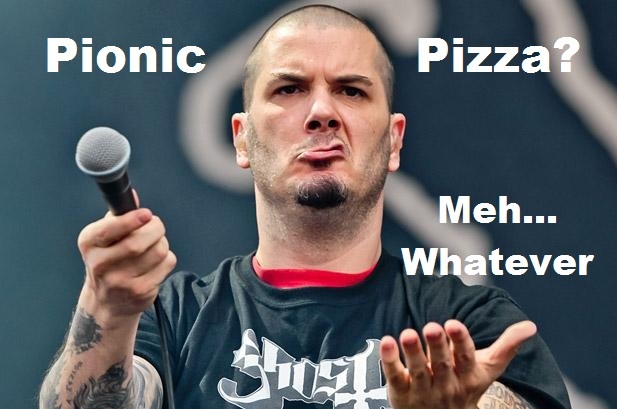 If you call yourself a pizza place, you better have a decent pepperoni option, otherwise to quote Pantera, better walk on home boy! Pionic's pepperoni pizza was...fine (just like the sauce I rated earlier). It did its job. One step up from some Red Baron frozen crap, maybe a tad better than Papa Johns, but definitely not in the top 10 around town. Not even close. There just wasn't much to it. I'm sure the kids will like it and for those that don't know what actual "pizza" tastes like, this'll do I suppose. It was thin crust, which I prefer, but the sauce this time around was bland, the cheese seemed a bit greasier and the actual pepperoni were just lil rounds of "whatever". Mind you it was like six bucks and was made in less than two minutes so, it has that going for it. Otherwise (with a shrug), "eh". Pionic also does salads. Basically you just point and say "that one!" and a kid behind the sneeze guard will put a grip of the greens into a bowl and before you know it, you've got yourself a pile of veggies ready to jam into your craw. The salad I actually got into. With the poppyseed dressing lightly drizzled over the loaded plastic vessel this dish actually had some crisp and fresh flavor. We combined the field greens with some spinach and just, literally, got one each of the topping options and we were not disappointed. I mean, what more can you say? It was a salad. It was a good salad. It was around five bucks. Done. Now here is where some damage sets in. We opted for the penne pasta tossed with pesto and topped with artichoke hearts, roasted red peppers, garlic, tomatoes and basil. Seemed like a winning combo, yeah. It would have been if the pasta was cooked correctly and the pesto had any depth of flavor to it. Now, doing al dente pasta is the way to go, any fan of the popular carb knows this. Thing is, the penne wasn't toothsome, it was just chewy. Not too sure how they got away with that but it wasn't soft and it wasn't crunchy; it was more like biting into little rubber tubes. This required lots of water (aka beer) to wash it down. And the pesto. Um, yeah..."pesto". I'm sure it was made with a kind of olive oil, possibly some salt and garlic, some "basil" maybe, Parmesan perhaps, but it was just feckled oily green stuff and did nothing to enhance the pasta or any of its components. In fact, gnawing down on the multitude of gummy penne greased with this mossy impostor just made us sad. That and the roll that came with it looked like Admiral Ackbar, which actually made us laugh. So, in the end, we had run the gamut of emotions all based off of sub par pasta and some pizza. Thanks Pionic. A pleasant surprise came in the form of dessert cannoli that we did not order. Did they know it was the Tucson Homeskillet ordering up a bunch of crud and to butter our bread they just threw in some chocolate chip fused dainty wafer pastry filled with creamy deliciousness, or did the zitty kid filling our order just thought with all the food we did order why not some dessert as well? Don't know if they make this stuff on site or if it's imported from another source but (and this is coming from someone that usually skips dessert and just goes for thirds) I have to admit the cannoli was good. It was light and airy with a good vanilla punch that was accompanied by some real chocolate chips. I liked the cannoli. I did. After mediocre pizza, a good salad and that whatever that was penne pesto was, it was nice to round things off with a fun treat. So, cheers again Pionic. You have options Pionic. You can either stay the way you are, sitting on Campbell Avenue surrounded by a plethora of pizza and pasta distilleries, selling your uninspired wares to folks that are taken with the fact that their hot food was made in less than a few minutes and that they get to choose their own toppings and be fine with that. Or you can step it up a notch or two, start your brand now, make your franchise reasonable for the first few that dare and become the next go to fast casual restaurant because there's not a lot of pizza and pasta places like that around town. Or anywhere really. We can see Pionic Pizza either being a nice idea that goes bust because after a few takes you get bored with the same tolerable choices on acceptable food items day after day or we can see it take off into the stratosphere with a few tweaks and enhancements here and there. We liked Pionic enough not to hate it but it's gonna take some time and effort to really see this concept through. With that we say good luck Pionic Pizza. The choice is yours. I disagree with your post, as I love Pionic and their food is delicious. I especially love the pasta, and this comes from a person who orders pasta in every restaurant I visit- especially the pesto pasta. I know that they use the best cheese on the market, and I think that it is better than any other cheese I have had at other pizza places. Hopefully they stepped up their game since we were there. We'll try it again in the near future. Thanks for your comment! This is a fun place with a two-faced appeal. The top floor at San Francisco event venues is for all that sass and oomph. It was super packed, but we just wanted to check it out. Loved the solid selection of quality craft beers.